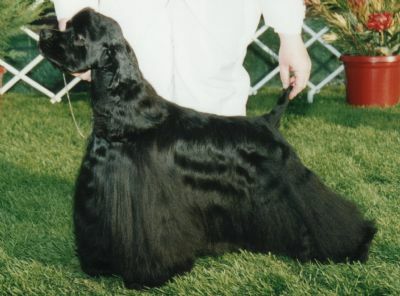 From a singleton hand reared pup to his first Best in Show at 11 months at the ACSCV under Alvin Grossman in 1996- still the only puppy to have won BIS at an American Cocker specialty in Australia -to his Best in Show at the Victorian Gundog Show (500 entries ) at 16 months under John C Ross to his last BIS in New Zealand 6 years later with Keith Brown and Robin Gray it was one hell of a career! Winning both the State(1997) and National Point Scores (1999) for the ACSCV he also won Eleven Best in Shows, Five runner Up Best in Shows and thirty eight Best in Groups. Whilst in New Zealand he successfully competed in the Supreme Dog Show Contest winning Supreme Gundog in 2001- in 2002 he was knocked out by his grandson who won the same award!Ambrose was an incredible show dog who gave his all in the ring every time.The sire of 10 champions in Australia and New Zealand his children and grandchildren include Multiple BIS Winners, Royal BOB winners and the Group winner at Tux in New Zealand, he is now quite happy at home in retirement on the bed!However he came out of retirement to again team with Robin Gray to win Best clipped off at the ACSCV championship show in Nov 2006 under Mr John C Ross from Canada- nearly 10 years after he won his first BIS there! !